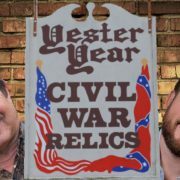 The United States Postal Service™ began its commemoration of the 150th year anniversary of the Civil War in 2011. A souvenir sheet with two stamp designs has been issued each year, from 2011 to 2015. 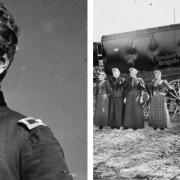 Under the direction of Art Director Phil Jordan, historical lithographs, paintings, and chromolithographs were selected for the stamp designs. 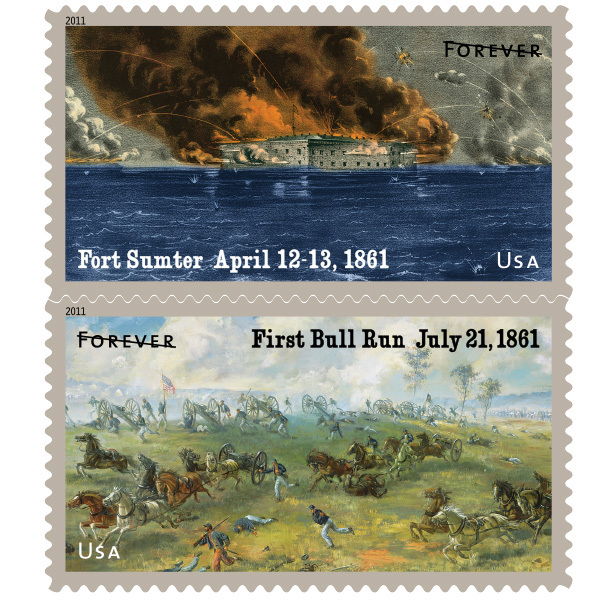 The First Bull Run stamp is a reproduction of a 1964 painting by Sidney E. King titled “The Capture of Rickett’s Battery.” The painting depicts fierce fighting on Henry Hill over an important Union battery during the Battle of First Bull Run. 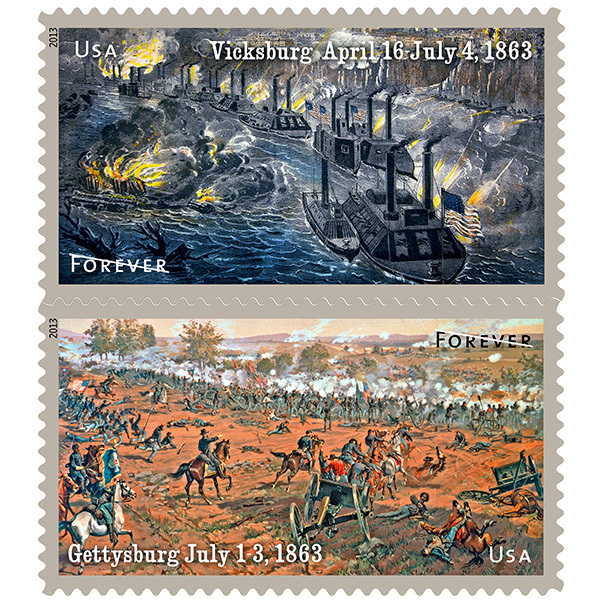 The Battle of Antietam stamp is a reproduction of an 1887 painting by Thure de Thulstrup. 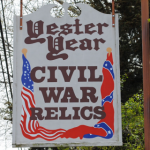 The painting was one of a series of popular prints commissioned in the 1880s by Boston publisher Louis Prang & Co. to commemorate the Civil War. 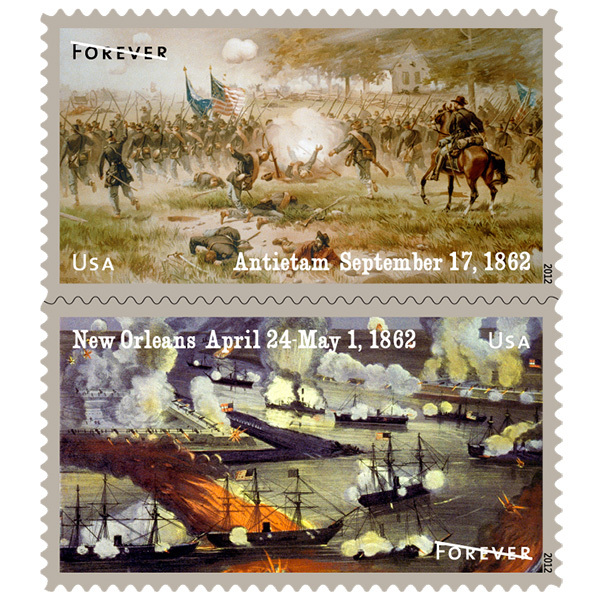 The Battle of New Orleans stamp is a reproduction of an 1862 colored lithograph by Currier & Ives titled “The Splendid Naval Triumph on the Mississippi, April 24th, 1862.” It depicts Admiral David G. Farragut’s fleet passing Forts Jackson and St. Phillip on the way toward New Orleans. The Battle of Gettysburg stamp is a reproduction of an 1887 chromolithograph by Thure de Thulstrup (1848-1930), a Swedish-born artist who became an illustrator for Harper’s Weekly after the Civil War. 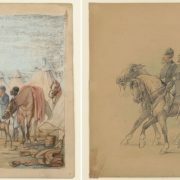 Thulstrup’s work was one of a series of popular prints commissioned in the 1880s by Boston publisher Louis Prang & Co. to commemorate the Civil War. 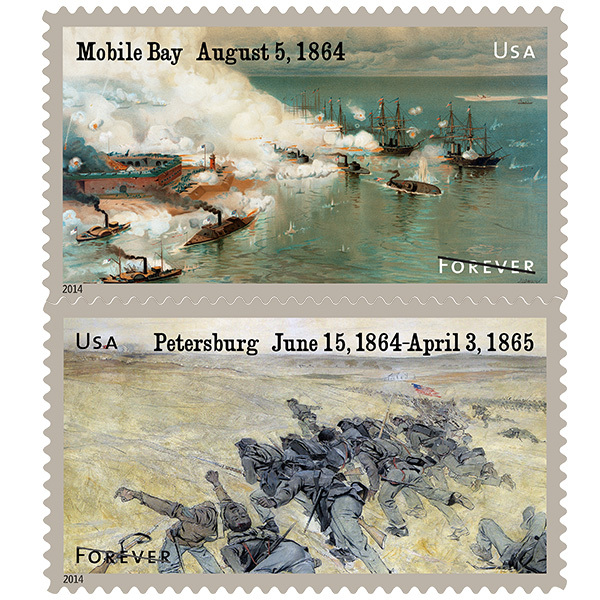 The Battle of Mobile Bay stamp is a reproduction of a painting by Julian Oliver Davidson, published ca. 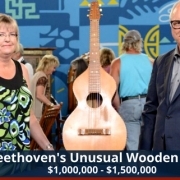 1886 by Louis Prang & Co. The Petersburg Campaign stamp is a reproduction of a painting, dated 1892, by J. André Castaigne. 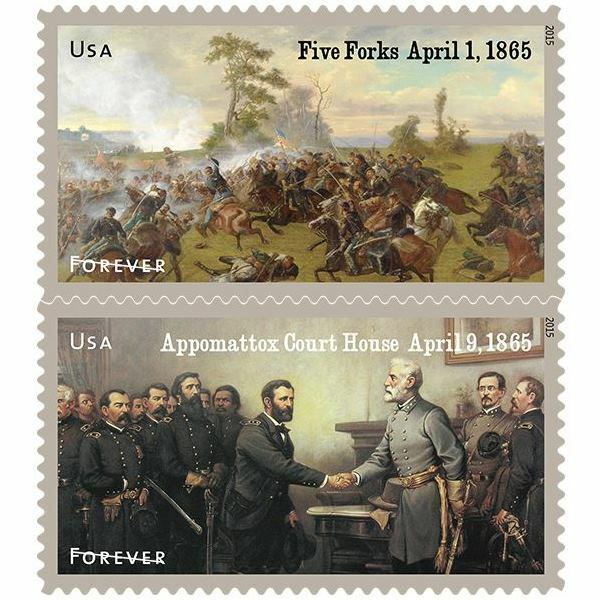 The Battle of Five Forks stamp is a reproduction of a painting, circa 1885, by French artist Paul Dominique Philippoteaux. 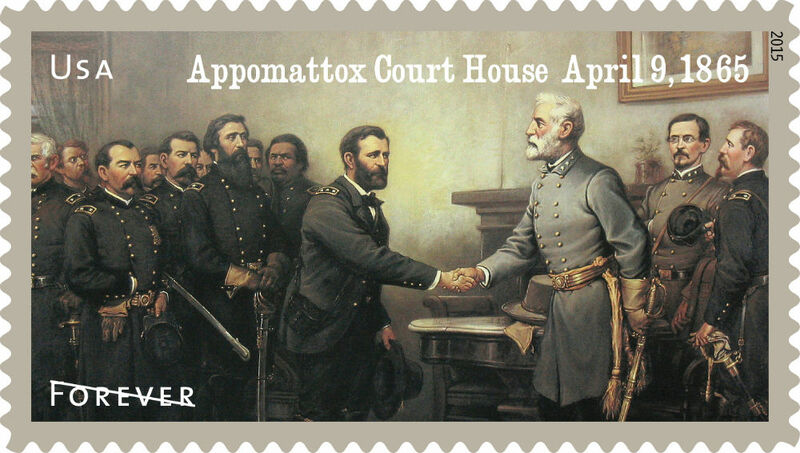 The Appomattox Court House stamp is a reproduction of the 1895 painting “Peace in Union” by Thomas Nast, depicting Robert E. Lee’s surrender. 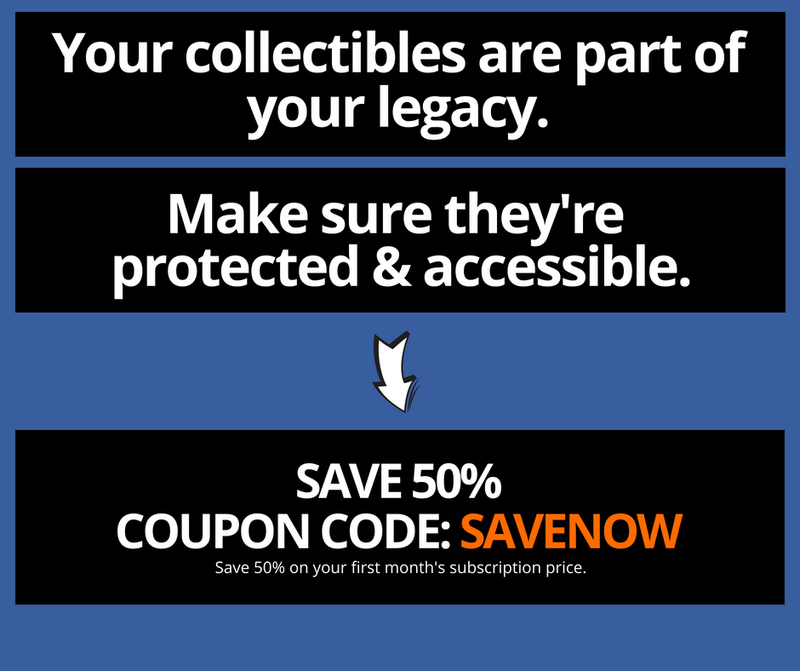 To view/purchase the entire commemorative series, visit uspsstamps.com.